Cameroon, officially the Republic of Cameroon, is a unitary republic of central Africa. It borders Nigeria, Chad, Central African Republic, Republic of Congo, Gabon, Equatorial Guinea and the Gulf of Guinea. Cameroon, a German colony at the time of World War I, was split among the French and British as war spoils after the defeat of Germany. In 1960, French Cameroun became independent as the Republic of Cameroun, and merged with the southern part of British Cameroons in 1961 to form the Federal Republic of Cameroon. It was renamed the United Republic of Cameroon in 1972, and the Republic of Cameroon or République du Cameroun in 1984 (its official languages are English and French). Archaeological finds show that humankind has inhabited Cameroonian territory since the Neolithic. The longest continuous inhabitants are probably the Pygmy groups such as the Baka. The Sao culture occupied the area around Lake Chad c. AD 500. The Kanem-Bornu Empire later came to dominate this area. Kingdoms, fondoms, and chiefdoms arose in the west, including those of the Bamileke, Bamun, and Tikar. Portuguese sailors reached the coast in 1472. They noted an abundance of prawns and crayfish in the Wouri River and named it Rio dos Camarões, Portuguese for River of Prawns, and the phrase from which Cameroon is derived. Over the next few centuries, European interests regularised trade with the coastal peoples. Meanwhile, Christian missionaries established operations and gradually moved inland. In the early 19th century, Modibo Adama led Fulani soldiers on a jihad against the non-Muslim peoples ( Kirdi) of the north and those Muslims who still practiced aspects of paganism. Adama established the Adamawa Emirate, a vassal to the Sokoto Caliphate of Usman dan Fodio. Ethnic groups who fled the Fulani warriors displaced others, resulting in a major redistribution of population. The German Empire claimed the territory as the colony of Kamerun in 1884. They moved inland, breaking trade monopolies held by coastal peoples such as the Duala and steadily expanded their control. The Germans established plantations in the forested south, especially in the coastal southwest. They made substantial investments in the colony's infrastructure, including the building of railways, roads, and hospitals. However, the indigenous peoples were reluctant to work on these projects, so the government instigated a harsh system of forced labour. With the defeat of Germany in World War I, Kamerun became a League of Nations mandate territory and was split between French Cameroun and British Cameroons in 1919. New Kamerun, territories acquired by Germany in 1911, became part of French Equatorial Africa. France improved the infrastructure of its territory with capital investments, a supply of skilled workers, and continued forced labour. French Cameroun eventually surpassed its British counterpart in gross national product, education, and health care services. Nevertheless, these developments were largely relegated to Douala, Foumban, Yaoundé, and Kribi, and the territory between them. The economy was carefully tied with that of France; raw materials sent to Europe were then sold back to the colony as finished goods. Great Britain administered its territory from neighbouring Nigeria. Natives complained that this made them a neglected "colony of a colony". Nigerian migrant workers flocked to Southern Cameroons, removing the need for forced labour but angering indigenous peoples. The plantations were returned to German administration until after World War II, when they were consolidated into the Cameroon Development Corporation. British administrators paid little attention to Northern Cameroons. The League of Nations mandates were converted into United Nations Trusteeships in 1946. The question of independence became a pressing issue in French Cameroun, where numerous political parties held different ideas on the timetable and goals of independence. The Union des Populations du Cameroun (UPC) was the most radical of these and advocated immediate independence and the adoption of a socialist economy. France outlawed the party on 13 July 1955, prompting a long guerilla war and the assassination of its leader Ruben Um Nyobe. France eventually granted increasing degrees of autonomy to the territory's governing bodies. In British Cameroons, the question was whether to reunify with French Cameroun or join with Nigeria. On 1 January 1960, French Cameroon gained independence under President Ahmadou Ahidjo. On 1 October 1961, British Southern Cameroons reunified with them—Northern British Cameroons opted to join Nigeria instead—as the Federal Republic of Cameroon. The continuing war with the UPC allowed Ahidjo to concentrate power in the presidency. The resistance was finally suppressed in 1971, but the declared state of emergency persisted. Ahidjo emphasized the importance of nationalism over tribalism, using fears of ethnic violence to further consolidate power. Ahidjo's Cameroon National Union (CNU) became the sole political party on 1 September 1966. In 1972, the federation was abolished in favour of a United Republic of Cameroon headed from Yaoundé. Economically, Ahidjo pursued a policy of planned liberalism. Cash crops were an early priority, but the discovery of petroleum in the 1970s shifted focus to that sector. Oil money was used to create a national cash reserve, pay farmers, and finance major development projects. Communications, education, transportation, and hydroelectric infrastructure were all expanded. Nevertheless, Ahidjo used posts at these new industries as rewards for his allies, many of whom had no development or business background; many failed. Ahidjo stepped down on 4 November 1982, leaving power to his constitutional successor, Paul Biya. 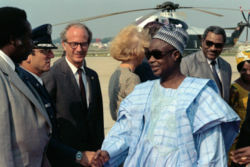 However, Ahidjo remained in control of the CNU, and a power struggle developed between the former and current president. When Ahidjo tried to assert the party's right to choose the president, Biya and his allies pressured him into resigning. Biya at first allowed open elections for party offices and for the National Assembly. However, after a failed coup attempt and the Cameroonian Palace Guard Revolt on 6 April 1984, he moved more toward the leadership style of his predecessor. Biya's first major challenge was the economic crisis of the mid-1980s to late 1990s, the result of international economic conditions, drought, and falling petroleum prices coupled with years of corruption, mismanagement, and cronyism. Cameroon turned to foreign aid; cut funds for education, government, and healthcare; and privatised industries. The growing dissatisfaction of Cameroon's Anglophones has since given Biya another challenge. Leaders from the formerly British portion of the country have called for greater autonomy, with some advocating complete secession as the Republic of Ambazonia. After the reintroduction of multi-party politics in December 1990, numerous ethnic and regional political groups have formed, such as the Social Democratic Front under John Fru Ndi and the National Union for Democracy and Progress under Maigari Bello Bouba. Biya and his Cameroon People's Democratic Movement have maintained control of the presidency and the National Assembly in national elections, but rivals contend that these have been unfair. The last elections were held on October 11, 2004. The President of Cameroon is the Head of State and Head of the Armed Forces. The President is given a broad range of powers, and is able to carry them out without consulting the National Assembly. He appoints the Prime Minister, who is Head of Government, and appoints to all civil and military posts of the state. He may also dissolve the National Assembly and, where circumstances so warrant, declare by decree a state of emergency which shall confer upon him special powers. Legislative power is exercised by the parliament, which presently is made up of only one house, the National Assembly. (The second house of parliament, the Senate, as of 2006, has not yet been formed.) The National Assembly consists of 180 delegates and meets three times a year. The main responsibility of the Assembly is to pass laws, but rarely has it changed any laws or blocked the passage of legislation. Judicial power is exercised by the Supreme Court, Courts of Appeal and Tribunals. Although the Constitutution prescribes that Judicial Power be independent of the executive and legislative powers, in practice, the judiciary is subordinate to the executive branch's Ministry of Justice. The Supreme Court may review the constitutionality of a law only at the president's request. Cameroon is a member of both the Commonwealth of Nations and La Francophonie. There is a nationalist resistance movement in the Anglophone region of Ambazonia. Cameroon is divided into 10 provinces and subdivided into 58 divisions (called départements in French). The divisions are further sub-divided into sub-divisions and districts. The provinces include: Adamawa Province, Centre Province, East Province, Far North Province, Littoral Province, North Province, Northwest Province, West Province, South Province, and Southwest Province. At 183,568 mi² (475,440 km²), Cameroon is the world's 53rd-largest country. It is comparable in size to Papua New Guinea, and somewhat larger than the U.S. state of California. 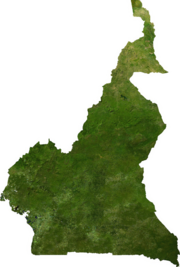 Cameroon's landmass is 181,252 mi² (469,440 km²), with 2,317 mi² (6,000 km²) of water. The country is located in Central and West Africa, bordering the Bight of Biafra, between Equatorial Guinea and Nigeria. Cameroon is sometimes described as "Africa in miniature" because it exhibits all the major climates and vegetation of the continent: mountains, desert, rain forest, savannah grassland, and ocean coastland. Cameroon can be divided into five geographic zones. These are distinguished by dominant physical, climatic, and vegetative features. Cameroon's coastal plain extends 10 to 50 miles (15–80 km) inland from the Gulf of Guinea (part of the Atlantic Ocean) to the edge of a plateau. In the former western state, however, the mass of Mount Cameroon reaches almost to the sea. Exceedingly hot and humid, the coastal belt includes some of the wettest places on earth. For example, Debundscha, at the base of Mt. Cameroon, has an average annual rainfall of 405 inches (10,290 mm). The plain is densely forested. The low southern plateau, rising from the coastal plain and dominated by tropical rain forest, has an average elevation of 1,500 to 2,000 feet (450–600 m). It is less humid than the coast. In western Cameroon is an irregular chain of mountains, hills, and plateaus that extend from Mt. Cameroon almost to Lake Chad at the northern tip of the country. This region enjoys a pleasant climate, particularly in the Bamenda, Bamiléké, and Mambilla highlands. It also contains some of the country's most fertile soils, notably around volcanic Mt. Cameroon. From the forested southern plateau the land rises northward to the grassy, rugged Adamaoua (Adamawa) highlands. Stretching across Cameroon from the western mountain area, the Adamaoua forms a barrier between the north and south. Its average elevation is 3,400 feet (1,035 m), and its climate is reasonably pleasant. The northern savanna plain extends from the edge of the Adamaoua to Lake Chad. Its characteristic vegetation is scrub and grass. This is a region of sparse rainfall and high median temperatures. The country has four patterns of drainage. In the south, the principal rivers—the Wouri, Sanaga, Nyong, and Ntem—flow southwestward or westward directly into the Gulf of Guinea. The Dja and Kadeï, however, drain southeastward into the Congo River. In northern Cameroon, the Benoué River (Benue) runs north and west, eventually into the Niger, while the Logone River flows northward into Lake Chad. Only part of Lake Chad lies within Cameroon. The rest belongs to Chad, Nigeria, and Niger. The lake varies in size according to seasonal rainfall. Some of the borders of Cameroon follow rivers, including the Aïna River and Ntem River. For a quarter-century following independence, Cameroon was one of the most prosperous countries in Africa. The drop in commodity prices for its principal exports — petroleum, cocoa, coffee, and cotton — in the mid-1980s, combined with an overvalued currency, widespread corruption, and economic mismanagement, led to a decade-long recession. Real per capita GDP fell by more than 60% from 1986 to 1994. The current account and fiscal deficits widened, and foreign debt grew. Yet because of its oil resources and favorable agricultural conditions, Cameroon still has one of the best-endowed primary commodity economies in sub-Saharan Africa. As with many developing countries, rapid urbanisation has created many strains on the economy. The single largest economic activity in Cameroon is still subsistence agriculture. Many obstacles are slowing Cameroon's growth; some of these include onerous levels of bureaucracy, crumbling infrastructure, and ingrained corruption. Recently, the government has claimed to be making another attempt to crack down on corruption and to create a more transparent business environment. the " Kirdi", non-Islamic or recently Islamic peoples of the northern desert and central highlands (18%). The Kirdi and the Matakam of the western mountains produce distinctive types of pottery. The powerful masks of the Bali, which represent elephants' heads, are used in ceremonies for the dead, and the statuettes of the Bamileke are carved in human and animal figures. The Tikar people are famous for beautifully decorated brass pipes, the Ngoutou people for two-faced masks, and the Bamum for smiling masks. L'Institut Français d'Afrique Noire (French Institute of Black Africa) maintains a library in Douala that specializes in the sociology, ethnology, and history of Africa. Of the several museums, the Diamare and Maroua Museum has anthropological collections relating to the Sudanese peoples, and the Cameroon Museum of Douala exhibits objects of prehistory and natural history. Cultural organizations include the Cameroun Cultural Association, the Cameroun Cultural Society, and the Federal Linguistic and Cultural Centre. There are also numerous women's associations (including the North West Women's Association for Rural Development), youth organizations, and sporting associations. Unlike women's organizations recently created by Western development agencies in places like Central Asia, associations of women in West Africa have a long, indigenous history. In contemporary Cameroon they are often registered as Community Initiative Groups, or CIG's, yet they continue a tradition of women gathering together to give emotional and economic support to one another. One such CIG is RENATA, also known as the Network Association of Aunties, which is working to end the widespread practice of breast ironing. Even though these groups are based on women dealing with women's problems (like child care, farming/provisioning the family with food, social justice etc.) they are not exclusive, and children as well as dedicated men are encouraged to join. In addition, movable holidays include the Christian holy days of Good Friday, Easter Sunday, and Easter Monday, and the Muslim holidays of 'Id al-Fitr and 'Id al-Adha. Two separate systems of education were used in Cameroon after independence. East Cameroon's system was based on the French model, West Cameroon's on the British model. The two systems were merged by 1976. Christian mission schools have been an important part of the educational system. Cameroon is known for having one of the best education systems in Africa. Primary school is both free and obligatory. Statistics say that 70% of all children aged between 6-12 years go to school, whilst 79% of the Cameroon population as a whole is literate. In the southern areas of the country almost all children of primary-school age are enrolled in classes. However, in the north, which has always been the most isolated part of Cameroon, registration is low. Most students in Cameroon do not go beyond the primary grades. The country has institutions for teacher training and technical education. At the top of the educational structure is the University of Yaoundé. There is, however, a growing trend for the wealthiest and best-educated students to leave the country in order to study and live abroad, creating a brain drain.